This start-up guide explains how to connect your Raspberry Pi 3 to the TMC5160-BOB – the breakout board of the brand new TMC5160. We’ll be using the internal Motion Controller and +3V3 logic supply for the TMC5160. The wiring will be limited to the basic functionality to communicate via SPI. The usage of the TRINAMIC’s API – TMC-API – is minimizing the software effort. The wiring is very simple. You will need 8 jumper wires. As a reference you can use the TMC5160-BOB_datasheet_Rev1.0.pdf. You will find the signals that are on each pin. An example code to initialize the TMC5160 is shown below. These files need to be placed in the same project folder as the TMC-API, in this case into ~/TMC_EXAMPLE. 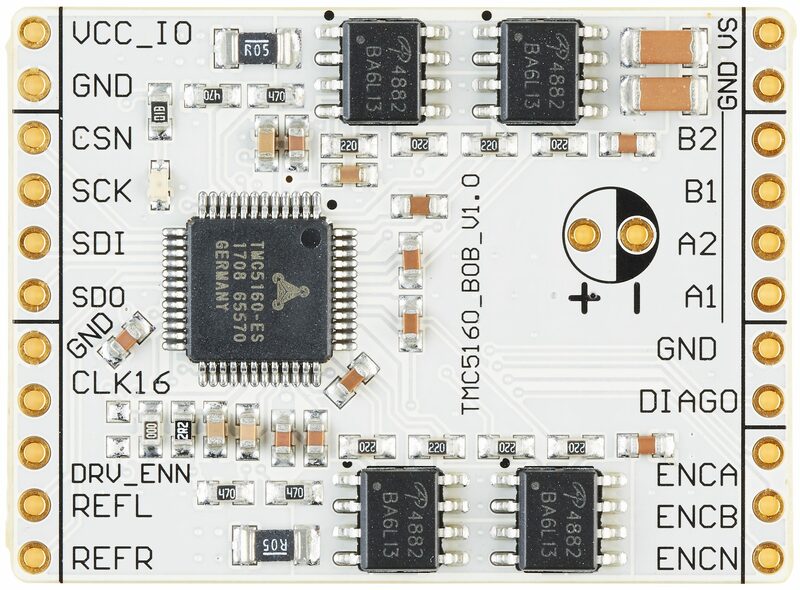 First, +3.3V is supplied to VCC_IO, the driver stages are enabled by pulling down DRV_ENN and the internal clock is used by pulling down CLK16. Afterwards, the TMC5160 is initialized and a simple move to position cycle is executed. The sequence will rotate a 200 full stepper motor 10 revolutions clockwise and 10 revolutions counterclockwise – depending on the wiring of the stepper motor. Please refer to the TMC5160 datasheet or the TMCL-IDE as a reference for the different registers. Use the following command to compile the code. Now you are able to execute this example. Be aware that the motor runs as soon as you execute the program. Win a BQ Witbox Go! Will this API compile on Beaglebone or will work with Arduino either? How about reading encoder pulses by this BOB module – any code is available in API? And last question: how 5160-BOB is comparable to 2660-BOB – I mean about reading encoder pulses for close loop and also about powering stepper with 2.8A/phase? yes, you can use this API also on a Beaglebone. You probably need to adapt the SPI function for the Beaglebone. On an Arduino it is not so easy to use. The Arduino IDE does not allow to have a folder structure as we have in our API. For reading encoder pulses, you can directly connect the encoder to the TMC5160-BOB and read out the pulses from TMC5160_XENC. By setting the prescaler it shows directly the encoder position in microstep. The TMC2660-BOB is a bit different. The TMC2660 is a plain driver IC (without integrated motion controller as the TMC5160 has) so you need to apply step/dir pulses to drive the motor and the encoder has to be connected directly to the MCU. For this we have no API code for a Raspberry Pi or Beaglebone, since it is for both crucial to have a realtime OS. This is a very interesting product. I needed some time to break through the documentation. At the beginning I will try to run in mode 2 with an external application and without collecting the signal from the encoder. Then I will try mode 1 and encoder. One more question: if two motion controllers are used for controlling axes X/Y (amateur laser cutter), then both of them must be addressed separately or is there some form of communication between them and the code can be simplified? Will I find the answer to this problem in the API or do I have to implement it myself? In addition, is there any documentation how to electrically connect several axes in such a system using 5160 so that the motion controllers cooperate? for controlling multiple axis / ICs, each one of them has to be addressed seperately. The API is currently working with 1 motor but it should be pretty easy to extend it to 2 or 3 axis. You should be able to reuse most of the code for the additional axis. The API is in continous progress and multiple axis control is on the agenda. I will try to do it then. I would like to make SPI communication using PRU on BBB. I will see how it will go. I do not know just what I can gain from SPI communication. Step/Dir is working very nice at PRU at this moment with BeagleG code from Henner Zeller for example or Replicape project (they using TMC2100 on a cape for BBB -they also use SPI but only for some chipset configuration). Is the use of SPI can improve something here or is it better to stay at TMC2660 with step/dir commands and save some bucks? What do you think? using step/dir is probably more straight forward since the firmware is already written for this. For using the internal motion controller you would need to adapt it. BTW: You can also use the TMC5160 in step/dir to have all benefits like higher currents, stealthChop2™, differential current sensing, etc. In this case you only need the SPI to configure the run current, chopping mode (spreadCycle™ or stealthChop2™). Yes, and this is the reason why I will probably stay with TMC5160. It has all the newest features compacted into one small chip, so for me is very versatile. Thank you again and I let you know about the effects. Either way, good job with this API. Best regards and have a good weekend. Marco, thanks for the comment. I’m interested in using the TMC5160 for CNC electronics, the dcStep feature is very interesting from a cnc milling perspective when milling through materials like metal. However dcStep appears to be an open loop system and I don’t think you can use an encoder at the same time. and also a TMC4361A (or an Arm controller chip) to keep track of the encoder inputs / position? The TMC4361 has an integrated sync pin which allows to syncronize several axis. Besides this the TMC4361 allows full closed control. let me thank you first for this tutorial. how can the A (rms or max) for the motor be set on this board? Do I have to change some resistor on the pcb or can I do it via a TMCL command? Could not find any info on this. you can change the motor current by changing the IHOLD (current at standstill) and IRUN. Am i right to assume that the same commands used to configure tmc2130 should work for this IC (want to use it without the motion controller). I know tmc2660 uses different registers but it seems tmc5160 uses the same ones as tmc2130. Is this correct? Don’t want to destroy them while trying :). Does the firmware of the Landungsbrücke have to be renewed? this combination is currently not supported by our TMCL-IDE because the TMC5160 needs to be selected as driver, not motion controller. We are currently working on a version that supports this. yes, the TMC5160 uses the same commands as the TMC2130 plus some additional ones. In the datasheet it says phase-current A is 2.8 (RMS), so for what is 8 standing for and for what is 15 standing for? Are these mapped numberspaces? Where can more information about those commands be found and what set number is giving what amp? finally found it in the datasheet “TMC5160 DATASHEET (Rev. 1.06 / 2018-JUN-06)” on page 74. So do I understand it (? ), when IRUN=31 is put, it takes 32/32 of the max A, e.g. 2.8A(RMS) for the tmc5160-BOB. If e.g. IRUN=15 it takes 16/32 of it, that would be 1.4A(RMS)? Does it work in that way? I’m developing with a 5130-bob, is there anything similar to this for the 5130? Or can I use this example and just change the includes to use 5130.h instead of 5160.h? I’m running it from a Raspberry Pi. you can basically use the same code, include the 5130.h instead and rename tmc5160_writeInt(..) accordingly. For the TMC5130 you might want to use a slightly different configuration for GCONF. Thanks, I’ve got the 5130-bob driving a stepper quite nicely after fixing GCONF (basically 04 instead of 0C),however I notice that Your code is pretty basic and only supports a single motor (as mentioned above). I need to support multiple motors (at least 2, preferably 3 or 4),, which physically the pi is quite able to do. Are you likely to be changing the underlying packages (broadcom driver and wiringpi are both used in the code above). Can you give me any idea of the likely timescale for a multi motor version! for supporting more than 1 motor you can simply change the code for the function “void tmc40bit_writeInt(u8 motor, uint8 address, int value)”. E.g. add a switch case and define an unique CS for each motor. As you mentioned this is a very basic example. An example for more than one motor would be great but is currently not planned. We are trying to run this example with no success. The TMC5160_XACTUAL register reads the value that was written on the TMC5160_XTARGET register but the stepper motor does not move whatsoever. We have tried different power supplies, different motors and different raspberry boards. Could you give us a hint on how to debug this? please make sure that DRV_ENN (9) on the TMC5160-BOB is at low level and that TMC5160_CHOPCONF is initialized properly. am besten ist es hierfür unser Support System zu nutzen – der blaue Bubble, der sich auf jeder Seite befindet. Thanks for the delightful tutorial. I would like to integrate the TMC5160 in an existing project utilizing the STEP/DIR interface – as far as I understand it, the STEP/DIR interface is easily enabled by desoldering R2. Is here also an example for setting the necessary parameters (mainly current and microsteps, plus some Trinamic-specific settings) with a simple microcontroller via SPI in Arduino style? we currently have no example that is using step/dir. I’ve written a very basic driver in python for the 5130 using the SPI interface, this is a lot easier to setup and run than the C code example and should be simple to adapt to other chips (like the 5160) that use the same interface technique. thank you for sharing your Python code. I think this can be very helpful. I want to use 2 tmc5160 to drive 2 motors by SPI. The motors should drive the same speed at the same time, but should be able to power of or drive individual. -should i better use a master and 2 independent slaves or a star connection(SPI)? -if i use 2 independent slaves i have to select by CS where i want to read and write and always use motor0 like your example, right? will the TMCs become their label (MOTOR0/ MOTOR1) because their interconnection or or how does that operate? -Can i readily #define MOTOR1 or what i have to respect in exept for the hardware connection? 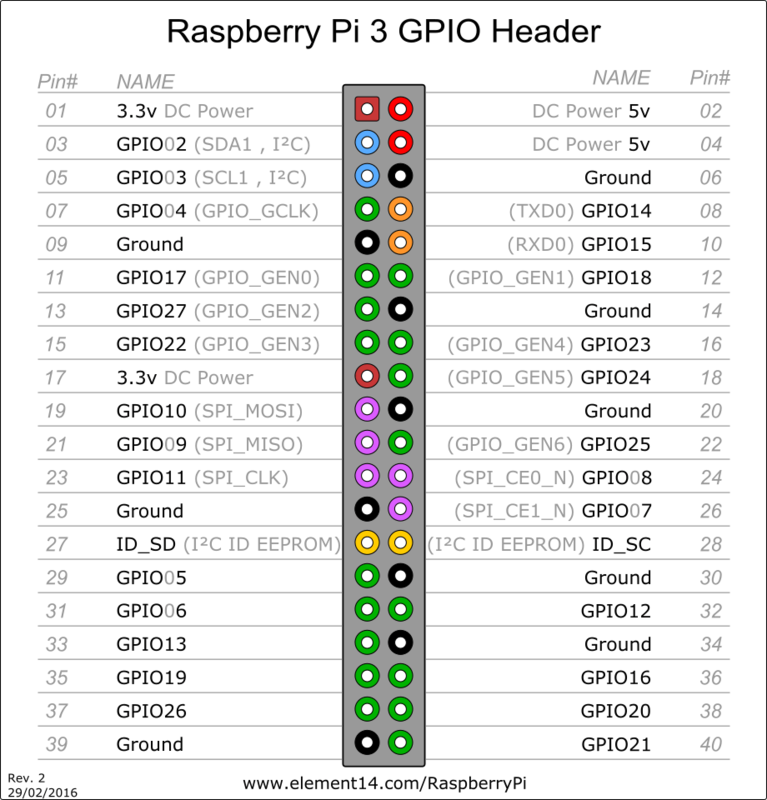 why do you use wiringPi instead of bcm2835_gpio_write to set the gpios? when I created this example there were some issues using bcm2835_gpio_write with the Raspberry Pi 3. This library was not updated yet. it is better to use independent CS for both ICs because this gives you more felxibility. You will also have to extend the functions void tmc40bit_writeInt(u8 motor, uint8 address, int value) and int tmc40bit_readInt(u8 motor, uint8 address) e.g. with an if, else if to define the the IOs / CS which are linked to which motor. I use an independent CS for each IC and the other GPIOS (MOSI; MISO; CLK; DRV_ENN; VCC) are linked, but it doesnt work. Can you explicate why i have to extend the functions? Is not only the CS relevant to ensure a correct communication? Then i initialize the Motor settings (CHOPCONF etc.) for each Controller/ IC. The first looping flow let the motors drive but then they are in “hold”. After the first drive they stay in hold even if i execute the code again. Iam desperate and dont make any progress, i will be deeply grateful for your help and any solutions! this is of course possible as well. After connecting encoder’s ABN to TMC5160 BOB board and setting the encoder register, how am i able to position directly to encoder positions since XTARGET is the only one register i could found to manipulate position in RAMPMODE0(position mode). I set ENCMODE = 0x72C and ENC_CONST to 198608 since my encoder’s resolution is 16000; however, sometimes is seems to have some step loss between XCTUAL and X_ENC. Is there any extra setting need to be done? The TMC5160 provides a simple encoder interface / decoder. It does not have any closed-loop control logic implemented. This needs to be done in the higher level, e.g. your MCU or using a TMC4631. Simplest way is doing it in software by comparing XACTUAL and X_ENC. When there is a deviation greater than a specific value just set XACTUAL to the value of X_ENC. Since both values are constantly changing while the motor is rotating this should be done at standstill, e.g. after a position command to see if the motor actually reached the target position. In the TMC5160 Datasheet, Section 3.3MOSFETs and Slope Control, it is indicated that the DRVSTRENGTH parameter should be adapted to gate drive resistor value / Mosfet Miller charge. The BOB has a 22Ohm gate resistor, yet as far as I can see in your example, the DRVSTRENGTH is still at its default setting of 2 (GD Resistor < or = to 7.5Ohm). for this example I kept using the reset defaults values which is technically total fine. Usually you want to have as fast as possible slopes to achieve low switching times and to minimize switching losses. The downside of fast switching slopes / high gate current is the EMV behavior. Since this is just a maker example it is not tuned to fit any EMV standards. The datasheet of TMC5160 describes two error flags s2vs & s2g. Does these error flag represent Short between motor coils and VS/GND OR short between coils their self ? the error flags describe short between motor coils and VS/GND. Your Arduino Code is incomplete, can you post it please? I need to connect five of these to a raspberry pi, will that be possible? And is there an easy way to make them work like a 3D Printer = Marlin Firmware? Yes, that works in theory. You can use 5 chip select signals to use the same SPI channel. We have purchased the TMC5130, TMC5160 and TMC5161 BOB for evaluation and will decide which best fits our needs, then purchase more. I’ve setup the TMC5160 as shown on here connected to a Raspberry Pi 3B+. After I run make and execute the example all I get is “Reply of TMC5160: 0x0d2000a0, then Reply of TMC5160: 0x0000000, then Reply of TMC5160: 0xba2d00ad which repeats line after line until I Ctl-C out. I’m not a programmer, so please dumb down to my level if you have any suggestions or ideas what’s going on. I also would like to run the TMC5130A BOB and TMC5161 BOB to compare the results and behavior, so any suggestions on how to do this with the same relative code is appreciated, but 1st I need to get the TMC-5160 working!! did you connect external power / motor power (24V) to the TMC5160-BOB? I replied earlier but it didn’t get posted. Yes, I have power but it’s 12v, is this a problem? The motor is a NEMA 17 400 step 2.8a motor. I’ve used this motor at 12v volts with 1 or 1.4a amp current limit with a A4988, DVR8825, & Pololu Tic-500 (MPS6500 chip) all successfully runing from the RPi 3B. I’ve even coding my own control in Python with the Tic-500. I can’t get the TMC-5160, nor the TMC-5130 to operated at all, even rewired the setup 2 or 3 times with same result. I just rewired the TMC-5160 again and ran the code shown here (with 04 correction indicated) and same result with the inital “Reply of TMC-5160: 0x0d2000a0, then 0x00000000, then never ending sting of 0x7a2d00ad. I ctrl out and reran and the never ending string became 0x02a2d00ad. Please help as I’m lost as to what to do now! can you send / link a picture of wiring? Hi Mario! Is there any reason to use a Watterott SilentStepStick based on TMC5160 instead of TMC5160-BOB, assuming that we control it with a RPi? Would a TMC5160-BOB have more functions which the SilentStepStick doesn’t have (like encoder inputs)? yes, you are right the BOB has more functionality / more pins routed to the connector than the SilentStepStick. Therefore it has also larger form factor. The TMC5160-BOB has also an enabled Motion Controller, while the SilentStepStick only supports step/dir.